Part 3 of my series on how to be a great public speaker. I want you to imagine an early civilization. Take your mind far back in time, before humans had discovered paper or writing. Imagine a cave with drawings on the wall and skins covering the floor and a group of people huddled around the glowing embers of a fire pit. How did this group come together? How did they develop shared interests and experiences? Storytelling allowed early human beings to learn about and understand one another. Even after written communication developed, humans never lost their love of storytelling. From the tales of faraway places offered by traveling bards to the thrills and chills of ghost tales around a campfire, people have always loved a great story. Science tells us that sharing a story with your audience engages them in your ideas at an emotional level that cannot be achieved by sharing facts and figures alone. Emotion and character-driven content actually trigger different parts of a listener’s brain than other forms of communication. When you tell a story, you are activating your audience’s mind to join you in a shared experience. It was this characteristic of oral tradition that drew people together to form early societies. In modern times, our glow often comes from stage lights or overhead fluorescents. But, the benefits of storytelling remain the same. The shared experience of a story can enhance your audience’s engagement and memory of what you’ve said. Additionally, hearing a good story makes us feel good. Stories cause our brains to synthesize oxytocin. That’s why many of us enjoy works of fiction whether books, movies, or audio stories. So, when you include a story in your presentation you up the entertainment factor for your audience. How Do You Find Your Story? At this point, you may be thinking, “Kit, this isn’t my wheelhouse! I don’t have any stories. How do I find a story?” Don’t worry. You can do this. The best stories are ones that are genuine. Think about what inspired you to discuss your topic. Or, share how what you’ve learned has impacted your life. For example, when I presented my speech about listening at Inbound 2016, I shared how not listening got me in some pretty hot water! It’s okay if you don’t want to get that personal, though. When I wrote an article on the same topic, I chose a different story to share. To find your story, consider your history and daily experiences. What has inspired or amused you lately? Is there a parable that has guided you or a person that has influenced you? You could share a recent article or movie that has made you think. Don’t limit yourself to just one idea. Brainstorm several and keep them in a list that you can refer to later. Choose a story that suits your audience. Select the story from your collection that you feel is most relatable to your listeners. Use descriptive words that engage the audience’s senses and emotions. Don’t just report events but enliven your tale with details about your characters. Include some suspense in your story that encourages your audience to pay attention. Then reward that attention with a few twists or surprises. Remember to add a little humor to your speech. Everyone loves a reason to smile. Weave your story throughout your presentation. Wrapping your story up and relating it to your topic at the end will make your ideas more memorable. Ready to practice your storytelling? Try this exercise to get your brain going! Think of a topic….the first thing that pops into you mind! Do you have a personal story that relates to the topic? A story about someone else or a friend? I love to share my passion for great communication. If you have any questions, don’t hesitate to ask! 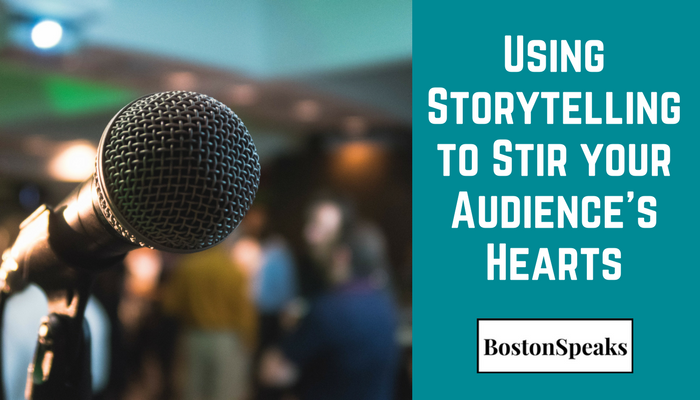 Learn even more about storytelling, public speaking and communication at the BostonSpeaks Blog.